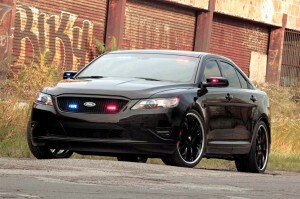 Ford Police Interceptor Stealth Concept - AutoNetTV Media, Inc.
It’s sneaky, sneaky. The Ford Police Interceptor Stealth Concept is on display at SEMA. Designed to hide all the police trappings, this car will give you quite a start when it lights up your rear view mirror. Maybe your car doesn’t have hidden compartments for additional weaponry, but its tire pressure monitoring system may save lives nonetheless.